It's tomato time! 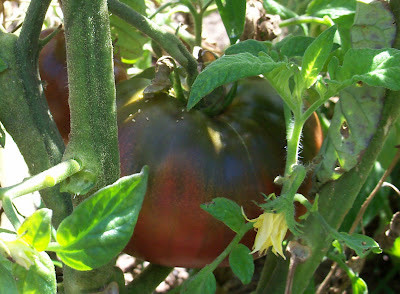 This is one of the so-called 'black' tomatoes with the dark green shoulders. Most of these are rarely seen in the grocer's shelves because they have such thin skin. I tell gardeners the best way to eat these is to take your plate and fork to the garden and eat it right off the plant! They are delicious and worth the effort! cutting your production seriously if you do not have the bulk of your summer plants in the ground by now. Inland, the hot weather will flatten cool season plants much more seriously than closer to the ocean. On the coast, if we have a typical summer, we have until the end of the month to get almost all of our cool season veggies out of the soil. We can have an atypical summer too. Sometimes it gets hot here and the cool season veggies are wasted just like those in further inland (including the San Fernando Valley). Other times, it is cold and foggy through June and we can have carrots an beets until July. One never knows, so it's best to have a little of both. Once they are out of the ground, usually I will wait until September before taking another crack at planting those cool season veggies. With our tomatoes and cucumbers and all the rest in the ground, we can step back and admire how pretty everything is: just perfect! Doesn't last all that long – take a picture now while you have the chance! Do all that is listed for May if you haven’t done so yet, but do so with the thought that you’ll need to be more attentive to your plants’ water needs, and if you are inland, the later in the month it gets, the more stress your plants will be under to get their roots established in the ground before really hot weather hits. If you haven’t gotten your slower growing heat lovers in by now, it would almost serve you better to wait until next year. I’m thinking of some squashes and pumpkins – the big ones. The bigger the squash or pumpkin the longer it takes for them to get ripe; some of these take 100 days to harvest time, check that out, that’s over three whole months!, and will not ripen fully without the good heat. On the coast, if we cool down right after Labor Day, it can be challenge to get them ripen to perfection. Inland, you need to know your climate. Do you get cold in September or is the heat still on full blast? Most of you will say, heat still on. But those who have a little elevation might be thinking, heat? September? Not so much! 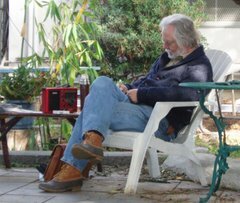 It bears repeating, that no book can speak to your personal microclimate and your local conditions trump any book ever written. Including this one. Take what is written as a guideline, but always look at your local conditions and do not be afraid to modify what is written with a good dose of reality. Learn to trust your senses. The mulch around your plants needs to be up to at least three inches – provided of course that your plants are taller than 6 inches, as most of summer's crops are. Add any kind of organic matter at all. It matters little what it is, but don't be stingy with it. The worms will come up from the ground in the night and pull bits of the mulch down into the soil, creating air pockets as they come and go and depositing their castings all through the soil. This is what they do and you make them an important and viable part of your soil ecology by allowing them to do what they are born to do – besides it saves your back and makes for a much more enjoyable garden all the way around. And that's what we all want to do – enjoy the garden! Garlic planted last fall will come due soon. Racambole garlic – the hardneck kind of garlic that I prefer – will begin to grow a hard center stalk that will eventually have a small group of bulbils on it. The hard neck grows up to almost even with the leaves and begins to make an elongated “Q” shape. Once this shoot begins to make its sweeping turn, begin to hold back water. Keep an eye on it and once they have begun to brown, pull them. Other garlics are a lot less dramatic. As their leaves begin to turn brown on the tips begin to hold back on the water. As the leaves begin to turn fully brown, pull the garlic bulbs, shake the soil from them as best you can and leave the plants in dappled sunlight for a few days until really dry to the touch. You can then braid the softneck garlics and tie the hardnecks into a bundle. Hang them in a cool dry place – I know, like we have those in Southern California, but do the best you can. Remember, if you have planted both kinds of garlic, the hard necks will often have a more garlicky taste, but they will not keep as well as the soft necks. The soft neck allows the bulb to be sealed more effectively from the air and so helps it last longer. Eat the hard neck garlic first, then, keeping the braids of soft neck garlic until later in the winter. Onions are much the same way – if you have good sized bulbs and the tops are not turning brown, you might need to knock them over at the very top of the onion. This will cause the onion to 'seal' off the bulb from the stalk and will help the onion last longer in your pantry. Mind you, this is not possible with all onions – only the big round ball shaped storage onions. My favorite onion, the Italian Red Torpedo onion, is not a keeper and will need to be eaten fresh – I usually pull them as I need them because they keep better in the soil than they do harvested. The first onions are pulled a little smaller than full sized, the middle ones are pulled as they reach full girth and the rest as I need them, mostly they are gone by the 4th of July. But they are delicious off the grill (like candy!) until they are gone. A note on the name 'Italian Torpedo...' I finally figured out that 'torpedo' was a bastardization of the name, 'Tropea.' I couldn't figure for the life of me why an onion was like a torpedo, but one day I saw the shape of the onion and found it came from Tropea, Italy and it suddenly made sense. They are a long red onion and until you have had them, you just don't know what you are missing! Normally, onions, a long season crop, are bought as 'sets;' small plants someone else has started growing for you and you set them in the ground to finish them off. Several years ago, my supplier was out of Italian Torpedo onions and I was forced to buy packets of seed. Guess what? Worked out fine. Onions are a relative of the grasses. It is easy to sow the seeds closely in a small container. They can be transplanted easily without a lot of effort. The only problem one must look out for is to avoid underwatering. All those little guys in one pot can soak up the water faster than you might guess. When they are about three inches high, push a hole in the ground with a dibber (a hole poker stick like thing – a pencil is small dibber, as is a finger – which can get tired – a one by one plant stake is a moderate sized dibber). Sometimes called a dibble or, in fits of covering all sides, a dibbler. Take your pick of a name. Poke the hole in the ground, drop the plant in roots first (always important) and the push the dibber in around the plant to force the soil flush up against the just planted plant. It is an easy way to transplant many plants without digging all those holes. It works best, for obvious reasons, only on small plant like the onions or other bulbs. I just started growing shallots after fighting off the mystique that they had to be difficult. They take the same care as onions, and are in fact easier to grow and provide a more reliable harvest than onions. And, while you can buy onions rather cheaply, certainly the same cannot be said about shallots! So, dollar for dollar, shallots are a more tempting allium to grow than onions! Look for October's chapter for more on planting onions, garlic and shallots because that's when you get started. Now for those of us who did it last October, we are at the end of the cycle – the yummy part! 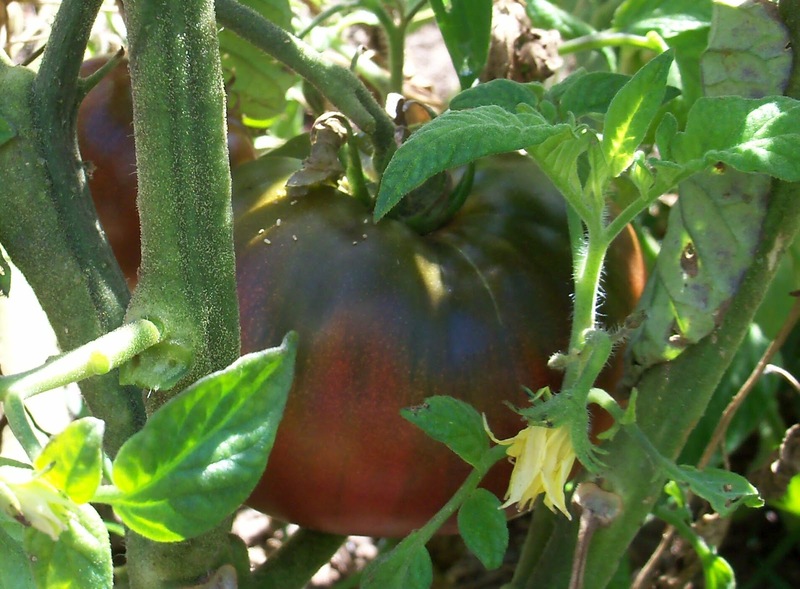 Have you staked up your tomatoes yet? If you haven't, you may well find yourself resigned to having free-range tomatoes this year! Once plants reach a certain size, it is more destructive to try to corral them into a cage than to let nature have its way with them. You may escape with the best harvest ever, but, as much of a risk taker as I am, that's one bet I don't place. Even a lone bamboo pole at the back is better than nothing. Use some soft ribbon or old rags to tie them up – string or twine can damage the plant. I have my tomatoes planted with two basil plants and one pepper plant for every tomato plant. I'm doing companion planting to discourage pests and to not drain the soil of the nutrients needed by one plant. I could have planted more tomato plants closer together, but all those plants would draw on the same nutrients through the soil. By planting different plants near by, I am using the same ground but perhaps not pulling nutrients of the same exact profile from the whole bed. There will be slightly different nutrients used by the basil and pepper. This helps me keep my soil more fertile – as you know, I eschew the use of all fertilizers. I think they end up being harmful to the soil in the long run. Even the organic ones. 'Organic' heroin is just as bad as chemical heroin. As a part of the companion thing, most folks will add in marigolds for pest deterrence. Marigolds are considered as one of the pest deterrent workhorses of the summer garden. And the yellows, oranges and whites of these plants make a colorful addition to the summer garden. It doesn't hurt to have some color! Beans and corn can be grown as succession crops in summer. Corn probably is a bad choice for most of us in Southern California because it takes so much room – in fact, if you have enough room to do a succession planting of corn, you probably don't live in here! Corn, as we observed last month, has to be grown in fairly substantial blocks to allow for good pollination. Beans can be grown as a succession crop in summer. Put in several different kinds of beans all through June – just make sure you don't fail to water the seeds and the young plants on hotter days. They'll need more water than the rest of the garden until they put on some size, so pay special attention. Also on beans, watch for snails and slugs – in my experience, beans are the favorite meal of these pests and I have seen entire bean crops defoliated and it's a sad sight. Also try to keep a lettuce plant here and there on the shady side of taller plants – like corn and tomatoes. Some of the lettuces to try for summer are: Bronze Arrowhead, Gold Rush, Jericho, Mascara, Pablo, Rossa di Trento, Rossimo,Tango, Red Velvet, Reine de Glaces, Slobolt, Summertime, Sunset and Yugoslavian Red Butterhead. All of these promise to be “slow to bolt” or “hold well in heat,” but often that heat is 'heat' as in Maine or in Paris and not 'heat' as in Los Angeles! Marvel of the Four Seasons (Merville de Quartre Saison) is only Marvel of the Three Seasons (Merville de Trois Saison) in Los Angeles! If you have cabbage, broccoli or other cool season crops still in your garden, you'll probably have to kiss them goodbye soon unless this is a cooler June than usual. Even with “June Gloom,” the temperatures are usually too high for good tasting food from those cool weather plants at this time. If you have a cabbage or a broccoli close to being fully grown, watch it very carefully lest it bolt suddenly on a warm day. Broccoli will begin to show the yellow of the flowers. Once you can make out a pronounced yellow in the head, you cannot procrastinate picking it. If some of the buds do open, all is not lost because you can still eat open flowers, it doesn't however look the part as well. Get it sooner rather than later. Once cabbage has formed a head, it is acceptable to pick it. If you want the most cabbage for your square foot of land possible, feel the head. If there is 'give' to the leaves, you have a ways to go. A fully grown cabbage will be hard – there will not be space between the leaves and that flexibility will be gone. At this point, you need to pay attention to it. Once you see the outer leaves on the head begin to curl back on the edge, the cabbage is about to split open and the flower stalk will emerge. Once the head has split, you've not got a good eating cabbage on your hands, your cabbage is 'bolting,' going to seed. That's good if that was your intent, but very bad if you've been bragging about your amazing kraut recipe. If you do miss the signs and they do go to flower, leave them in the garden. Beneficial insects will find them a happy addition to their diet. Many of gardening your friends will be convinced you screwed up, but you can explain to them that you are saving the seeds and allowing the beneficial insects to have a good thing to eat. If this is not a hybrid crop, look into learning how to save your seeds for next year. It really is a good strategy and you can then brag about how insightful you are. Keep your garden moist – a tough trick as our world heats up. Your mulch will help. Water only in the cooler times of day – early AM or late PM. If you have troubles with mildew and other fungus problems, try to stick to the early mornings; any moisture on the leaves will have a chance to be wicked away and will less likely cause problems. However, if you, like me, are crunched for time, late in the evening is better than not at all! And on the coast, you'll have mildew no matter what you do. It is better to avoid over head watering if at all possible because the amount of water lost to evaporation and wind dispersal. If you can get one, a 'leaky' hose that sweats the water out at very low pressure is the way to go and is fairly inexpensive to boot. Turn the water on very slightly and, once the hose is full of water it will bead out of minute holes all along the length of the hose. Allow it to run for a very long time and you'll get water soaking down into the roots of your plants which is where you want it. You can use it much less frequently than you would an overhead sprinkler. Look elsewhere in this book for information on 'ollas.' This is an ancient version of drip systems I have begun to work with and am very excited about. Overhead watering can also encourage problems with mildew on plant leaves. You get a whitish sheen on your leaves that eventually kills the plant. If you grow squash, the 'work-around' is to grow your cucurbits fast ('cucurbits' refers to the family that includes all melons, squashes and cucumbers), get a crop and if that wasn't enough start more plants to keep the harvest coming. Of course, the ones you can't really do that with are the winter squashes and pumpkins. Their growing season is just too long to start over again so you really only get one crop. Still, grow them (if you have room) with plenty of light and air circulation. If you're lucky, you'll get a crop. In most years, you'll be OK, although you'll never harvest those record-setting pumpkins you can read about from points further east – like Kansas, Kentucky and Connecticut, for example. Marina de Chioggia squash produced a lovely crop for me last year even in a relatively shady bed! So go figure. That not withstanding, if you want a good crop of winter squash, I still advise you to put it in an area with abundant sunlight. And airflow. Try to insure your summer garden is in before the end of June. After that, it's beginning to be too hot to do all that digging and the planting you do will need extra water to get started. You don't really need a recipe this month. Most of the harvest can be slathered with a little olive oil and put on the grill. Keeps the heat outside the house and deliciousness ensues. It's time to begin to enjoy our world-famous summers!